Hi Nokia Atleast now you realised that people prefer 2 sim single cell. You how much market you lost ? Release it fast. Hence your profits you will touch in no time. Call recording ( In-built / uploadable ) available ? c2 is very good to have dual sim. but it seems the voice comes out from speaker at the back. maybe our indian friends who bought this can confirm. i have gone through all the given specifications. I feel that the screen is very small. 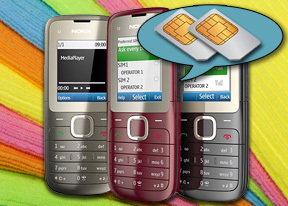 is avilable of option at a time receive the two sims phone calls like fly ds410 and samsung? i like this phone for daily used... and very cute and small in pocket i wait this phone.. this is the first nokia dual active phone.. good job nokia..
a, 01 Sep 2010hei what type of problem u r asking for ,voice leakage problem ,,,can u tell me in detail. @ a, Voice leakage refers to the voice leaked through loudspeaker at the back when we are talking on the phone. Most recent Nokia low-end devices like 1202, 1280, 1661, 1616, etc, have this problem. V, 01 Sep 2010Does anyone know if C2 has voice leakage problem?hei what type of problem u r asking for ,voice leakage problem ,,,can u tell me in detail. It looks like a good mobile. I think it must had a flash- light to complete it ! and what d real range of this ph.